I’m going to start with one of the most exciting areas of research today: the scaling of city size. The basic paper is Bettencourt et al. (2007), which started the current wave of scaling work. The major players have been physicists Luis Bettencourt and Geoffrey West, and economist José Lobo. 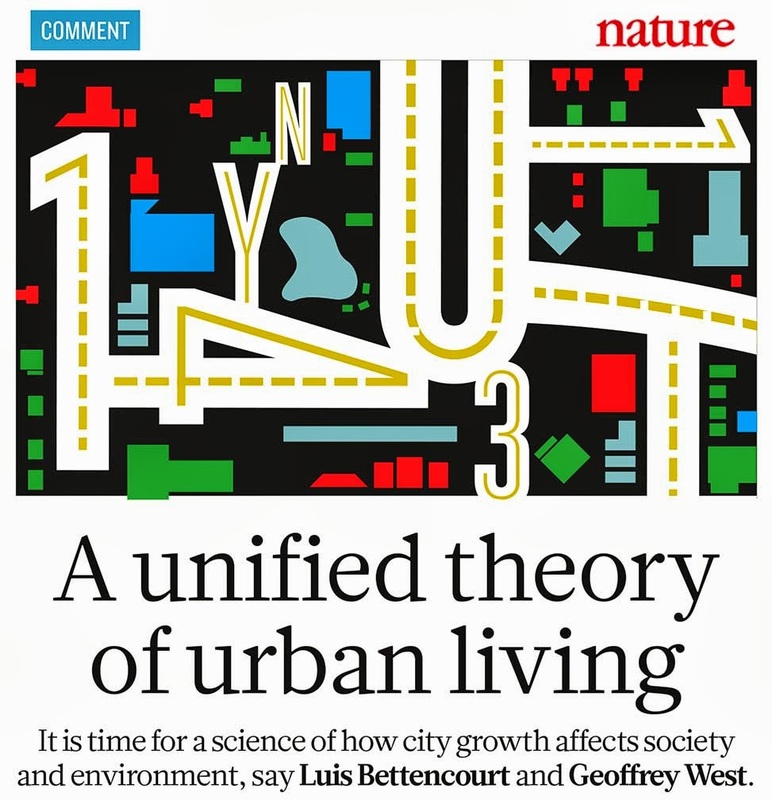 Luis Bettencourt's recent paper in the journal Science (Bettencourt 2013) is an attempt to develop a formal model of how urban scaling works. See also a number of associated works (Bettencourt et al. 2007; Bettencourt et al. 2010; Gomez-Lievano et al. 2012; Lobo et al. 2013). The math of these models is far beyond me, but I think I am beginning to understand the basic ideas and concepts. Scaling research begins with the observation that urban social and economic phenomena increase or become more intensive with city size. Larger cities not only have more people and cover larger areas, but they have more economic activity, more buildings and roads, more crime, more coffeehouses, more banjo-pickers, more drug addicts, and so on. While this is hardly anything new or exciting, it turns out that the mathematical relationships between population and urban phenomena follow two distinct patterns—both are power laws, expressing exponential change—that are called sublinear scaling and superlinear scaling. The first remarkable finding of scaling research is that these two patterns are numerically consistent, regardless of the sample of cities one considers, or which urban factors one is measuring. Let’s consider sublinear scaling first. Power law relationships are often portrayed on a double-logarithmic graph (each unit on the axes represents an increase of a power of ten), where the values will fall on a straight line whose slope is equal to the power law’s exponent. Sublinear scaling refers to relationships whose exponent is less than one. 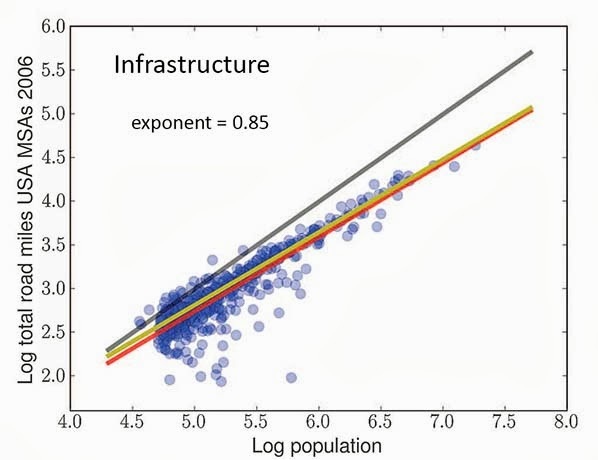 Bettencourt and colleagues found that urban infrastructure scales with population in a sublinear pattern, with an exponent approximately equal to 5/6, or 0.83. 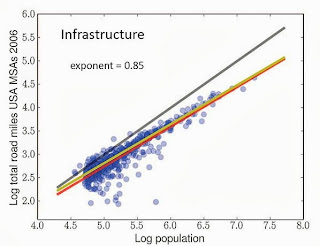 That is, whether one considers the length of roads, the total length of electrical cables or pipes, or paved area, these quantities exhibit sublinear scaling with urban population in a range of samples of modern cities (Figure 1, where infrastructure is compared to the gray line with an exponent of one). These patterns are analogous to the way that metabolism scales with body size across animal species, a body of research known as metabolic scaling theory (Mitchell 2009:chaps. 16, 17). This makes sense in that the body’s metabolic infrastructure (circulatory and nervous systems) consists of branching patterns, much like roads and cables in cities. Fig. 2, Superlinear scaling. From Bettencourt 2013. The second pattern of urban scaling is superlinear scaling. 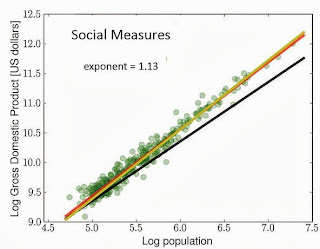 In this pattern, the social outputs have an exponent greater than one, a pattern not found in the nonhuman animal kingdom. Whether you plot income, patents, GDP, crime, or poverty, these social outputs increase at a rate much faster than the increase in population. Even the number of rock bands in a city scales with population in a superlinear pattern! (José Lobo, personal communication). Figure 2 shows this pattern, with an exponent of 1.13 (compared to the black “linear” pattern of exponent one). In urban economics, these results are described as productivity gains that result from economies of scale, the mobility of labor, knowledge spillovers, and other effects of agglomeration economies (Krugman 1991; Storper 2010). But in fact the causes of superlinear scaling of social outputs are more fundamental than urban agglomeration economies. They lie in the nature of human interaction within a given space. As the number of people in a settlement increases, the number of potential human interactions increases exponentially. This fact, which underlies the superlinear scaling of cities, was used earlier by Roland Fletcher (1996) as the basis of a model describing how behavior and the built environment change with increasing settlement size.This is the sense in which cities are “social reactors” (Bettencourt’s term) that magnify the effects of spatially-delimited social interaction to create even greater levels of social output, whether positive (such as wealth and innovation) or negative (e.g., crime and poverty). One implication of this research is that there is no fundamental difference between large and small cities in the nature of their growth and the role of social interactions (thanks to José Lobo for pointing this out to me). From Bettencourt and West's paper in Nature. Physicists Luis Bettencourt and Geoffrey West talk about these patterns as “laws” of urbanism (Bettencourt and West 2010). The patterns seem consistent, and together with José Lobo and others, they have come up with mathematical formulae to predict or capture the scaling results. My first reaction to all this, when I started reading this material, was negative. As a social scientist, the notion that human social behavior follows universal “laws” seems seriously misguided. But the kind of regularities described by urban scaling laws are not patterns of actual human behavior; rather they are patterns in the aggregate outcomes of large numbers of social interactions. One requirement of these laws is that people must move to larger cities. But they do that for many different reasons. There is no “law” describing how or why people move to cities. Not only is each decision unique, but the patterns of movement have many different social causes (e.g., employment needs; desire for a more varied social setting; following family members; etc.). 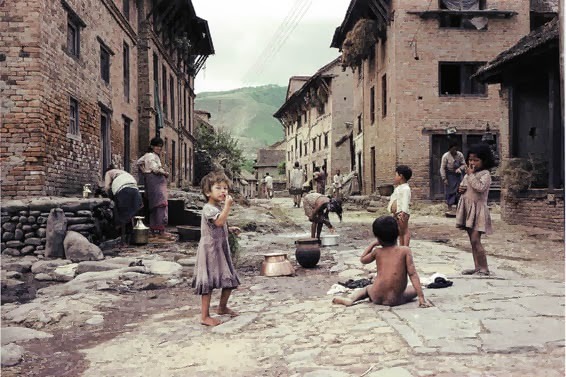 But if and when people do move to larger cities, and if certain other conditions are met, then the resulting regularities can be described as laws that operate on a higher level of generality than the actual behavior and institutions studied by social scientists. In short, I no longer see a contraction between the messy but patterned realities of social life as described by sociologists, anthropologists, and others, and the existence of laws of city size at a higher (or perhaps I should say, a more fundamental) level. 2007 Growth, Innovation, Scaling, and the Pace of Life in Cities. Proceedings of the National Academy of Sciences 104: 7301-7306. 2010 Urban Scaling and its Deviations: Revealing the Structure of Wealth, Innovation and Crime Across Cities. PLoS One 5 (11): 1-9. 2010 A Unified Theory of Urban Living. Nature 467: 912-913. 2012 The Statistics of Urban Scaling and Their Connection to Zipf’s Law. PLoS ONE 7 (7): e40393. 1991 Increasing Returns and Economic Geography. Journal of Political Economy 99: 483-499. 2013 Urban Scaling and the Production Function for Cities. PLoS ONE 8 (3): e58407. 2009 Complexity: A Guided Tour. Oxford University Press, New York. 2010 Why Does a City Grow? Specialisation, Human Capital or Institutions? Urban Studies 47 (10): 2027-2050. Fascinating! Thanks for this, and for making this work and its implications intelligible.